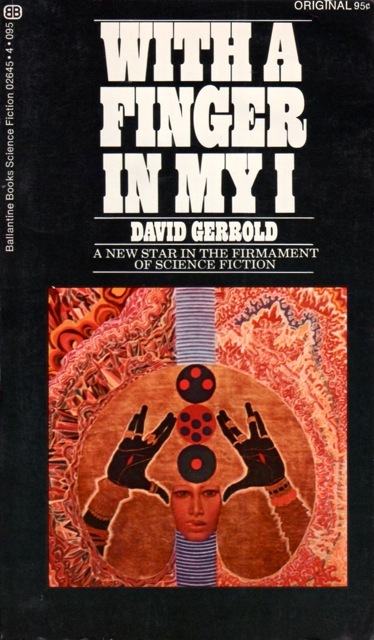 From the back cover: “Of the nine stories in this collection demonstrating the remarkably variegated talents of David Gerrold, six are completely, original, never having appeared in print anywhere before. David Gerrold’s work has all the earmarks of genuine talent. Primary among these is his ability to write emotionally. He can inject emotion into the most unlikely of situations and creatures. Beyond this, he loves words, knows how to use them, and isn’t afraid to do so in original ways, and–most blessed of all–he writes with enormous joy in his work. Don’t miss his original novel, SPACE SKIMMER, published in tandem with this collection. From the back cover: “Welcome to happy habitat, the most complete of all the world’s pleasurelands. All forms of pleasure are encouraged. All major credit cards are accepted. From the back cover: “Here is the book that opens up the science fiction scene to the masters of Western Europe. Gathered together by Donald A. Wollheim, whose annuals of the World’s Best SF are considered the most reliable indicators of what is the best in the English-language sector, sf readers at last have the opportunity to meet the best sf writers of the Wold World and discover for themselves new variations and unexpected approaches to all the themes of science fiction. My copy has no dust jacket. The image above is for the front cover. I am not sure if there was back cover or inside jacket flap information. So is the solution for people to read more widely and then write their own best-of lists? Or dispense with best-of lists altogether? I’ve thought about writing best-of lists for the pageviews but I’d rather explore one book in greater depth. However, I do find best-of lists useful when I’m looking for my next book to read. If the list writer likes one work I do, I might like the others they include on their list that I haven’t read. P.S. I’m also terrible on following-up with book recommendations. When I pick my next book to read, it’s one of the few times I let myself be totally spontaneous. Will, thank you for the comment. I am not sure there is an easy solution (the answer for most dilemmas!). That said, I know that lists spawn intense reader reactions. Either their ideas of “what is the best” is reaffirmed by the presence of their favorites on the lists or frustrated that their favorites are absent. I too have this visceral reaction. Many of the comments on my own 1960s list from years back that I keep from deleting solely as I add additional books to it as I read, engaged with the list in this visceral manner. If they were to look at my reviews, perhaps where I am coming from would make more sense (which gets at your comment about “I might like the others…”). SF is a heterodox group of authors and visions (even in the so-called “Golden Age”) and readers are terrified of NOT including what is the acknowledged best. And for new readers, I think it is our moral prerogative to indicate how varied (and often challenging!) the genre is so that their explorations might have more places to start. I am content to map my territory (50s-70s SF) and explore as I go. And hopefully a little of my intense passion for exploration (and the varied worlds I am so keen on) inspires a few readers… That is my goal. I like your goal! That’s similar to my goal with reviewing – trying to talk about books that people may have overlooked or going into a deep dive on a book or author. But it’s also important to sometimes zoom out and look at the big picture and how each book relates to the others, even if it’s only a comparison rather than a best-of list. I loved your discussion of best of lists. I have often wondered why I take my somewhat meandering journey through SF books rather than simply pulling out a couple of lists and reading the “best” first. I already have a lot of the books. Because of this approach I have read Silverberg’s The 13th Immortal (the cover robot by Ed Valigursky is far better than anything in the book) but not Dying Inside. I have also read many of Brunner’s Ace Doubles titles but not his great dystopias, I misplaced Jagged Orbit which is all things considered, embarrassing. Maybe there is something of the feeling of a reading assignment to a “to” methodical an approach. I also enjoy charting a writer’s progress or seeing how they reinterpret their favourite themes through a series of works. But mainly, in my case it may be a short attention span or a tendency to get distracted. I think I will have to alternate my approach. I tend only glance at reviews if the book is on my to be read list but I enjoy reading reviews after I have already read and posted on a work, to see what others think or what I missed. Looking at the authors in the Wollheim I have enjoyed the Klein novels I read but less so Lundwall’s but I have not read their short stories. The books first: I am excited about the Wollheim collection, a 1970s attempt to bring (albeit Western European) authors into the spotlight. Considering the number of Strutgatsky + Lem books published in the US, it seems like Eastern Europe was more represented (for obvious reasons, Communism was on the minds of many). There is nothing wrong with meandering! At least with me, even if I encounter something that is not at all enjoyable I like to see how it fits in the historical context of the day, etc. Reading is only one of my SF joys, the other joy is understanding the historical moment in which is was written…. Regarding “best of” lists: I typically enjoy reading them and use them primarily as a means of discovering new books to read. 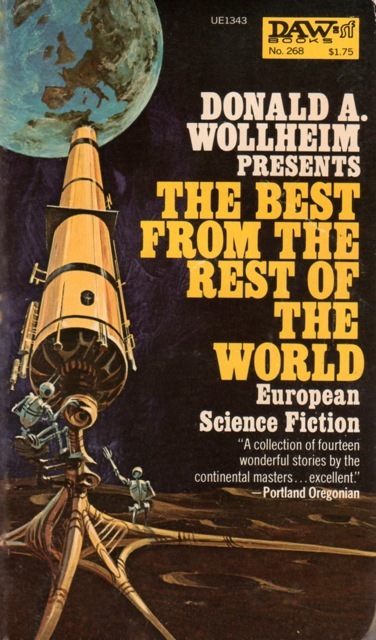 If I see a “Best SF Books of the 1970s,” I think by nature, a list confined to an era has to be subject to revision, as long as the person who wrote the list keeps reading and finds new hidden gems or overlooked titles. As noted in the other comments, I also meander through genres. I feel no obligation to read the Top 50 SF books or “canon.” As I get older and my to-read pile gets larger, I realize that I will never get around to reading every title that others say I “should” read. It may sound trite, but I like to read what I like to read. If I pick up a random DAW yellow spine or ACE Double and enjoy it, so be it. Part of the issue is nomenclature. Saying these are the “Top” books invites disagreement and comments of “I can’t believe you left off BOOK X!” We can argue about the “Top” of anything: Top BBQ in Texas, Top MLB Pitchers from the 1970s, etc. Perhaps the focus could be admittedly subjective: “My Favorite 1970s Novels and Why I Think They are Important” or something similar. As for books reviews, I largely read them after I am done with the book myself. I’m too often an outlier on what I like and dislike, and learning that a book has a 4.5/5 star average (or 2.1/5…) has little effect on my decision to read it. Like another person mentioned in a comment, I read the reviews afterwards to see if I missed something or for a good analysis of what I read. By the way, I just recently discovered your blog and have enjoyed going through the archives. I’m a sucker for great images of vintage covers. My 60s list made it very clear that it was “MY” top list, the comments I received did not imply that they understood. “You are missing the____” “It is confusing why you included this but not this___.” Etc etc. But yes, there is a certain joy to reading one’s own path. A lot of the SF I review was reviewed back when it was published and only once or twice since then! A fee years ago I made a ‘Best Sci-Fi novels of the ’60’s’ list on the Goodreads site. It’s an interactive list so other people can vote and make their own additions to the list. While it has been interesting seeing how my original list has been affected over the years by other people’s votes, for example my #1, ‘Stand on Zanzibar’ is no longer #1, the more widely I read from that era has resulted in my now disliking some of the books on that original list, such as a lot of Heinlein’s work. Best of lists are subjective and change over time. Now I’m more likely to read something by an author I’ve not heard of before than to read something that is considered a classic. I am glad that Stand on Zanzibar has had a resurgence as of late — it was out of print for years. I agree with the lesser known author comment. I can’t wait to read Mannes’ They (1968). 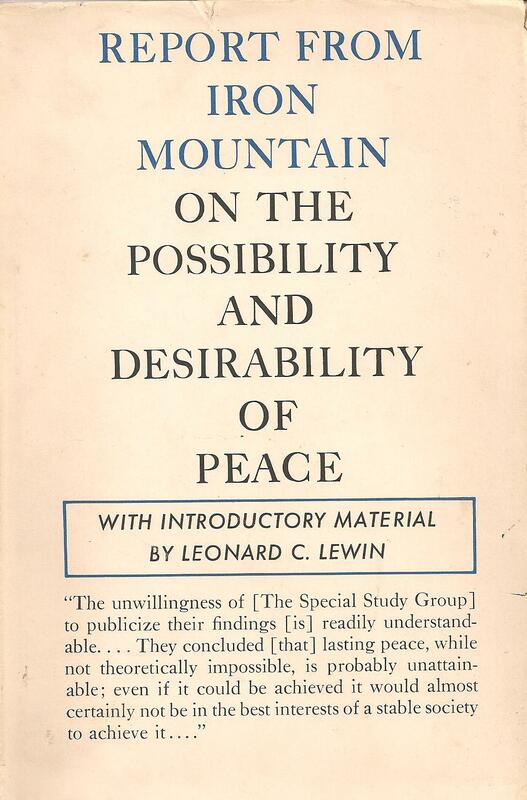 The next on my list, just finished M. John Harrison’s The Committed Men (1972). Non-Strugatsky and non-Lem? Kirill Bulychev – fantastic writer! Great thoughts about something I’m always wrestling with. Without best-of lists (or in my case, shortlists) I wouldn’t have known where to begin: my own random bookshelf pulls weren’t working and awards lists seemed like the answer. Now I see myself as working my way out from the center: each author I pull from a list, good or bad, seems to uncover yet another author or book not on a list. So, for a person like me who has been misled too many times by covers and blurbs, who is overwhelmed by choice, and who wants to understand (and critique) the historical background of the genre, reading straight off a list (at least at first) has its advantages. It’s still a problem, though, because lists are so ridiculously self-perpetuating– even juried awards lists favor the same authors and privileged backgrounds over and over and over again. Recent efforts for awards and lists to become more inclusive are still falling short: it will always be the top ten or so most recognizable names from year to year, so I often find myself wondering about which authors are being buried by the publicity machine. Then there is the problem that I actually do really really enjoy and value some of those canon authors and I don’t want to give them up (Brunner and Bishop, for example). And also the problem that I actually do really really enjoy reading horrible junk and telling people all about how horrible it is. In that sense, I see two efforts working in tandem to correct the idea of canon: the diggers (digging for new treasures) and the dismantlers (dismantling the established canon). I’d like to think I’m doing both, but I haven’t dug my hole deep or wide enough (yet) to find enough uncommon stuff. That’s what I’m always kicking myself for (and because when I do finally discover something I really cherish outside of the traditional canon, it turns out to be so far outside canon it’s not even considered SF by most standards!). As for your current dilemma about putting together a new list of Best 1970s SF, I would love to see your revamped list! But I also understand your concern about having not read widely enough (and you’ve read tons more than me!). Without doubt reading from a list was instrumental for me learning the genre. 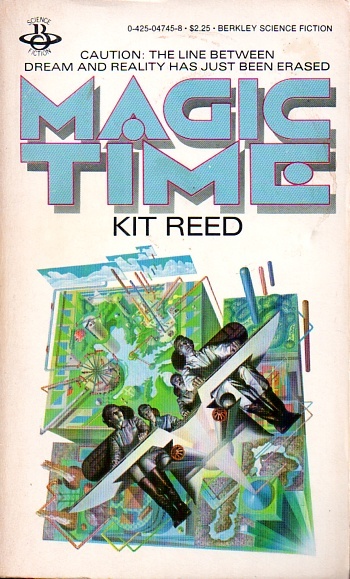 But, if you were to ask me the best 70s SF works back in the day, I would have regurgitated the novels that won the Hugo and a few that won the Nebula (which relates to my point about perpetuating canon). I am in no way even stating that the works which appear on the lists are somehow not worth reading! I will devour Brunner and Bishop any and every day! Any list I will make would have some on it. I think I am more interested in demonstrating the heterodox nature of genre which I don’t think really crops up in the “Best Of” lists. That said, I enjoy many of the standard “classics” picks, like Herbert and Le Guin etc. Regarding your point, ” it turns out to be so far outside canon it’s not even considered SF by most standards” — I have an unstated policy (I don’t know if I follow it all the time and certainly didn’t a few years ago) that I refrain from explicitly arguing whether something is or is not SF in I review it (i.e. Priest’s The Affirmation of Kavan’s Ice). I do this for a simple reason, the reader of New Worlds for example, would quickly realize that generic conventions are really really fluid. And that’s great! I will demonstrate with analysis rather than belabor the point. I went through my shelves a few days ago looking for books from the 1970s I should read before putting together a list, too many. I don’t think one will be coming anytime soon. Alas. My memory of Gerrold’s short story collection there was that it was generally competent but not great, and that surprisingly many of the stories had the punch line “and then they were GAY”! … Which probably had some visionary danger going for it at the time, but doesn’t much register now. Meantime I’ve been surprised by how much, and well, Gerrold is writing in short stories these days. The Magazine of Fantasy and Science Fiction even has a Gerrold Special Issue on the stands now. I think he’s transitioning into being an underrated writer. Perhaps a historical perspective is useful when tackling some SF… I mean, I’ve read so much 70s SF that avoided homosexuality etc altogether that I can certainly understand how that would be very different from other authors. We shall see! This is ridiculously late comment (think I beat my previous record of 10 days or two weeks… “twwwwoooo-weeeks!” as Arnie put it once). I like your opening confession/conundrum – or maybe, I *get* it, though it sounds like you’ve made a good go at reading EVERYTHING you can get your hands on. I’ve definitely based my purchase lists on things like the Hugos and scholarly studies by guys like Darko Suvin (frequently divergent lists, given Suvin’s scorn for popular SF). But sometimes I’ll just.. go for it, and see what happens. And it’s often very, very underwhelming (e.g., Van Vogt’s “The Changeling” and “Slan”). A couple in there are perhaps only partly “SF” (or bestiary, in the case of The Life of Insects), but well worth the read! Adam, although it might seem like I read everything, I most definitely do not 😉 I avoid almost all pulp, most of the classic SF authors (Van Vogt, Clarke, Heinlein, Asimov, etc). I’ve run my course with a lot of them, they no longer interest me…. I have yet to read any of Capek’s work, a blind spot in my knowledge for sure! I’m almost the reverse of what you say: don’t feel that I’ve explored enough of “hard” SF group (though I can check off the most popular fare – “Foundation” series, “Stranger in a Strange Land,” “Childhood’s End,” etc.). Yeah, I did my PhD work (partly) on Capek, so I was immersed in his stuff for a while. I do wonder how much of Capek’s novels are in print these days. I think I lucked out that my old university had some keen collectors and got in pretty much everything by the guy.